This workshop is associated with the congress of The Iberoamerican Society of Digital Graphics (SIGraDi) and will be held between 7th and 12th of November 2012 in Fortaleza, Brazil. The workshop in organized by Daniel Cardoso from the local committee, and will be held at the Universidade Federal do Ceará, in Fortaleza. The orientation will be by Gonçalo Castro Henriques (X-Ref | Fautl) + Affonso Orciuoli (ToolinGroup | Rede Brasileira Fabricação Digital) + Ernesto Bueno (X-Ref | ToolinGroup). 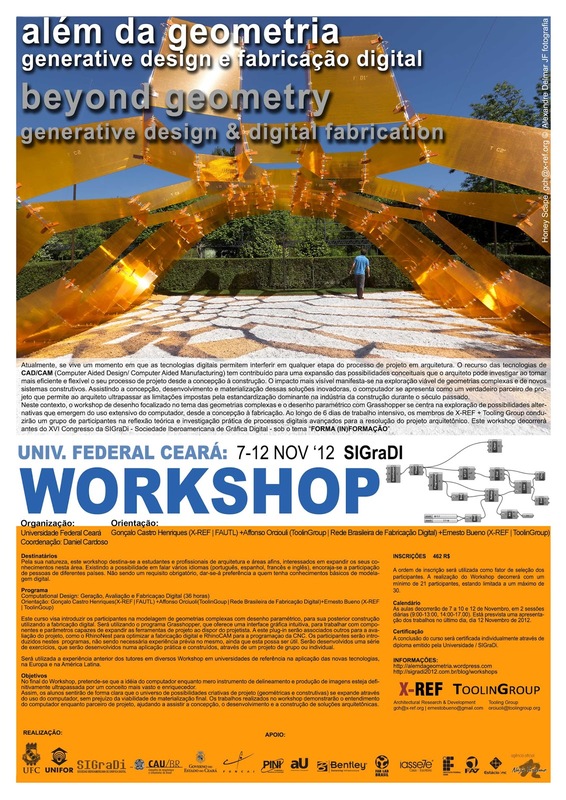 The challenge with this 5-day intensive workshop is to generate and fabricate a project using Grasshopper and RhinoCAM. It is expected to have participants from many countries. Although the classes are in Portuguese, the tutors can provide additional help in other languages such as Spanish, English and French. The workshop will benefit from the tutors' previous experience in various universities and workshops in the application of digital technologies in Europe and Latin America.